#293. Not saying “but” enough. There is really only one word you need to remember in this post and it is the word, “but.” I promise, that is all I am asking for. To get there though, to make that word make sense, we have to go to an island in a lake in Kenya and meet some orphans. Want to go? A few months ago, I had the good fortune to write about my uncle’s orphanage. He helped found it in Kenya on an island in Lake Victoria. One of the things I love about it is that Kenyans were part of starting it, it wasn’t one of those, “America fixes everything in other countries” kind of projects. 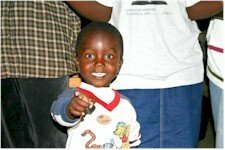 There are more than 300 kids, many of which were orphaned by the HIV epidemic. Some of the kids are HIV positive. It is without a doubt the most visceral representation I know of what it means to share God’s love. And it was close to be being burned down. With the violent unrest that destroyed a country that many would say AIDS has already destroyed, the orphanage was in danger a few months ago. There were threats. Guards were posted. The food supply delivered to the island was dwindling. Thanks to you and to all our fellow-servants who are in USA for lifting us and our bleeding country to the Lord. After receiving perhaps the most direct and serious threats from the mainlands, to the effect that we the only operating school in our region, I decided to call off my trip to Nairobi by the MAF plane which was coming to pick me. I called all staff and told them about the threats of those who were demanding that we close down or be burnt. I then gave each one room to say what in their view we needed to do and only two people were in favor of closure, with everyone else feeling strongly that we cannot release the children to all the dangers awaiting them outside of the orphanage. We will stay with the children. Deep inside I am reminded once more that this place is the true home many of these precious jewels of the Lord have. I asked myself, ‘Should I send them out there in the wild, or should I continue God’s work even when it is risky?’ I chose the latter and all I ask for is not sympathy but prayer that God would put his arms around these tender lives. This evening our plea to be allowed to continue serving the orphans for the sake of Christ was aired on the radio. Mention was made of us by name that we should be spared the ordeals going on throughout our country by now. Tonight the men will be working as guards of children, women and property as a response to the night attacks. We have no weapons but wholly rely on the Lord and the guarding angels of light. May the Lord bless and keep you. Only, here’s the thing, you can. Maybe there aren’t men with guns outside your door in the shadows of an African moon. Maybe you’re not on an island with a food supply that will run out if planes can’t get passed armed rebels. Maybe you don’t have to explain to eight-year olds how God can still love them even though they’re growing up with HIV in their veins. But in more ways than you can imagine or maybe admit, we will all face our own dark nights. And in his email Naphtaly hid a pretty powerful reminder of a reality we must all deal with. He wrote these because they were true of his situation. He did not have any weapons. His hands held no bullets, but they were not empty, for he relied wholly on the Lord. But that can’t be like you, can it? I could write a thousand examples there and hopefully you’ll share your own with me in a comment, but the simple truth is that each of us will face the darkness of the night. Armed rebels in Africa or apartment rent that’s late in Atlanta, each of us will stare out into the unknown and long for a weapon that just isn’t there. My prayer is that instead of being fake Christian super happy, you’ll admit that things can be tough. You’ll be honest about the first half and the second half of the sentence you could say describing your challenge. My prayer is that instead of seeing your hand as empty, you’ll see your heart as full and in the darkest of times will do what a Kenyan headmaster did, rely wholly on the Lord. My prayer is that you’ll say “but” more. P.S. Since I originally shared this story in January, the orphanage, which is also a school, made it through the rebellion without damage. If you want more info, their site is http://www.ggcckenya.com/. And thanks to the folks that have said they will share this story on their own blogs. That is very cool.